[207 Pages Report] The automotive sensors market, in terms of value, is expected to grow from USD 22.94 Billion in 2016 to USD 36.42 Billion by 2023, at a CAGR of 6.71% between 2017 and 2023. The strict government rules in regards to the fuel emission and safety norms have shaped the automotive industry. It has paved the way for automotive manufacturers to use various sensors in the vehicle to keep a check on the exhaust gases. Similarly, safety features such as ABS, EBD, and airbags are becoming mandatory with increasing demand for people safety. For the study, the base year considered is 2016, and the forecast provided is between 2017 and 2023. The sizing of the automotive sensors market has been done by the top-down and bottom-up approaches. The bottom-up approach has been employed to arrive at the overall size of the automotive sensors market from the revenues of key players (companies) and their share in the market. Calculations based on the number of different automotive sensors that are installed in different automobiles and the demand from all major countries is further added, and finally the volume is multiplied by the average selling price of each type of automotive sensor to arrive the overall market size. In the top-down approach, the overall market size has been used to estimate the size of the individual markets (mentioned in the market segmentation), through percentage splits from secondary and primary researches. For the calculation of specific market segments, the most appropriate parent market size has been used to implement the top-down approach. In the process of determining and verifying the market size for several segments and subsegments gathered through secondary research, extensive primary interviews have been conducted with key opinion leaders. The break-up of the profiles of primary participants is given in the chart below. The automotive sensors ecosystem comprises major players such as Robert Bosch GmbH (Germany), Continental AG (Germany), DENSO Corporation (Japan), Analog Devices, Inc. (US), Sensata Technologies, Inc. (US), Delphi Automotive PLC (UK), Infineon Technologies AG (Germany), and STMicroelectronics (Switzerland). All these companies have their own R&D facilities and extensive sales offices and distribution channels. The products of these companies can be used across various industries for respective applications. The report provides the competitive landscape of the key players, which indicates their growth strategies in the automotive sensors market. The automotive sensors market was valued at USD 22.94 Billion in 2016 and is expected to reach USD 36.42 Billion by 2023, at a CAGR of 6.71% between 2017 and 2023. The major factors that drive the market for automotive sensors are increasing motor vehicle production worldwide, increasing vehicle electrification, stringent government regulations, and growing consumer demand for sensors for the convenience and comfort. With the increase in concern over greenhouse gases emissions, fuel economy and emissions norms are becoming stringent in many parts of the world. Automotive manufacturers are facing pressure to use advance technology to reduce the emission and increasing fuel economy to reduce the carbon footprint. Automotive sensors are playing a crucial role in containing themselves in the regulation limits, and thereby helping the market to grow. The automotive sensors market based on sensor type has been further segmented into temperature, position, inertial, speed, pressure, oxygen, NOx, image, and other sensors. Others sensors include radar, ultrasonic, rain, relative humidity, particulate matter, LIDAR, and proximity sensors. Position sensors held the largest share in the market in 2016. Crankshaft and camshaft position sensors, among others, form vital parts in the functioning of a car. The increasing production of cars will further drive the demand for position sensors. 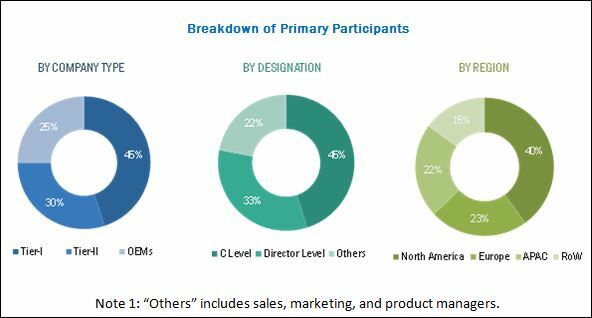 The automotive sensors market has been segmented on the basis of various applications such as powertrain, exhaust, chassis, body electronics, safety and control, and telematics. Others category includes vehicle security systems, vehicle tracking systems, and vehicle monitoring systems. The market for telematics is expected to grow at the highest CAGR during the forecast period. The rise in the use of sensors in navigation and infotainment applications would help the telematics application to grow. The increasing competition in the automotive industry has led manufacturers to include telematics in budget cars. The demand for such cars is very high in emerging economies such as India and China, which is helping the market to grow at a rapid pace. The automotive sensors market has been segmented on the basis of region into the Americas, Europe, APAC, and RoW. APAC has the highest market share and is expected to witness the highest growth rate for the automotive sensors market during the forecast period. The increase in purchasing power of the consumer, infrastructure development, and increasing demand for more efficient and safer vehicles are the main factors that are driving the growth of the automotive sensors market in this region. The presence of developing countries such as India and China contributes to the growth of automotive sensors market in this region. 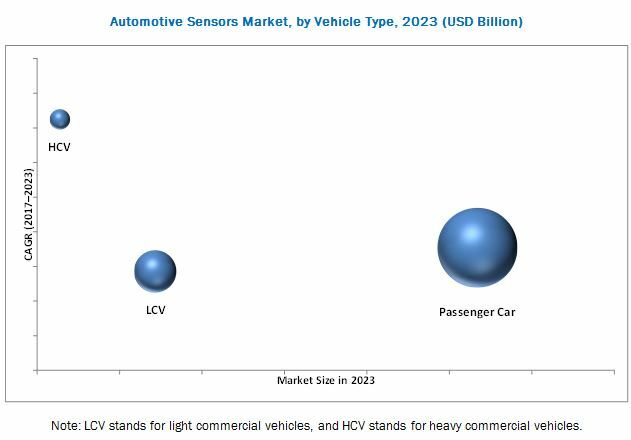 The automotive sensors market has been segmented by vehicle type into passenger cars, light commercial vehicles (LCV), and heavy commercial vehicles (HCV). Passenger cars currently account for the largest share in the automotive sensors market. Sensors in passenger cars help in improving the performance of the car along with significantly enhancing the safety and reducing the emission. The adoption of ADAS technology and growth of autonomous cars is helping the automotive sensors market to grow in developed countries such as the US, Germany, and the UK. Factors such as the price competitive market, underdeveloped retrofit, and lack of uniform fabrication process for MEMS pose a restraining block in the automotive sensors market. The key players in the automotive sensors market are Robert Bosch GmbH (Germany), Continental AG (Germany), DENSO Corporation (Japan), Analog Devices, Inc. (US), Sensata Technologies, Inc. (US), Delphi Automotive PLC (UK), Infineon Technologies AG (Germany), and STMicroelectronics (Switzerland), among others. Top Companies Analyzed for This Study are —Robert Bosch GmbH; Continental Ag; Denso Corporation; Delphi Automotive PLC ; Sensata Technologies, Inc.; Autoliv Inc.; NXP Semiconductors N.V.; ZF Friedrichshafen Ag; Infineon Technologies Ag; ELMOS Semiconductors Ag; Stmicroelectronics N.V.; Analog Devices, Inc.; Honeywell International Inc.; Allegro Microsystems, LLC; TE Connectivity Ltd.; Murata Electronics Co., Ltd.; Asahi Kasei Corporation; on Semiconductor Corporation; Panasonic Corporation; CTS Corporation; Maxim Integrated; Texas Instruments, Inc.; Amphenol Corporation; the Micronas Group; Omnivision Technologies, Inc.